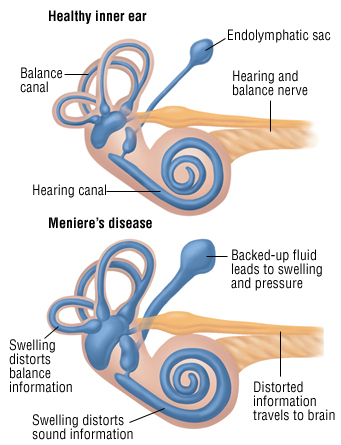 In Ménière's disease, fluid collects in the inner ear. Pressure from the buildup of fluid and damage to some of the delicate structures in the inner ear can cause a variety of symptoms that appear suddenly, without warning, and can last minutes to hours. Many people have only mild symptoms, but in others the symptoms are severe enough to be disabling. Hearing loss comes and goes, but over time some degree of hearing loss may become permanent. The cause of Ménière's disease is unknown. It tends to strike men and women equally, and although it can occur at any age, it usually begins between the ages of 30 and 50. In most cases, only one ear is affected. Only about 15 percent of people with Ménière's disease lose hearing in both ears.